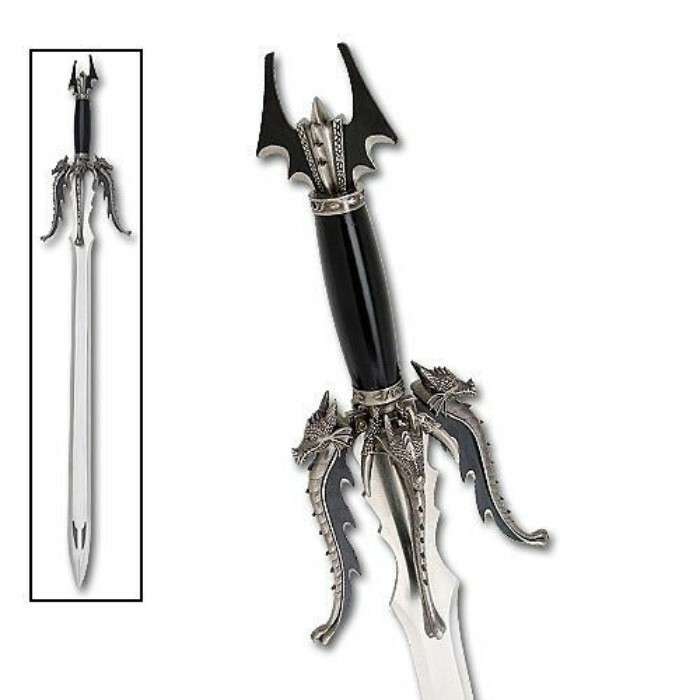 Dragons Bane Broadsword | BUDK.com - Knives & Swords At The Lowest Prices! Wield the Dragon's Bane! Measuring 38 1/8" overall, this epic fantasy sword features a detailed dragons encircling the handle that fold out to form an unique extra-wide four-pointed guard. This item also offers a 30 3/8" stainless steel blade with cross-pointed tip cut with intricate designs. A sure favorite for fantasy fans! Great sword! More than worth the price ... Perfect for any Dragon collector! This sword is amazing. Can't wait for my son to open it on christmas!!!! Amazing sword for an amazing price! The guard dragons extend out farther than shown & can fold in to touch the blade. The end of the blade is barbed, which I hadn't noticed from the picture, but, with the guard, makes this one of my most unique swords. An excellent weight, not too light but doesn't require two hands either. I absolutely recommend this to any sword or dragon lover-- you won't be dissapointed! Amazing detail, great looking sword! Came with a wooden wall mount, the guard can actually extend further than the picture. Pretty heavy. Awesome sword. Very uncomfortable to hold, but prefer 2 handed swords anyways but the problem was the guard. If your holding it the dragon holds stick down and if your hand moves even slightly up it gets stabbed by 8 horns. Not dangerous but its semi painful. Bottom piece of handle seems secure but spins around so have to fix that. Besides "using" issues this is amazing, although its staying on the wall. Despite the horns and the bottom piece along with messed up screw for display, I love this item, it looks amazing.